CSIRO is using the latest in computer gaming technology to help reduce the incidence of one of the most common cancers in Australia – bowel cancer. Colonoscopy is a difficult procedure to master, and gastroenterologists require hundreds of supervised procedures to reach an expert level. 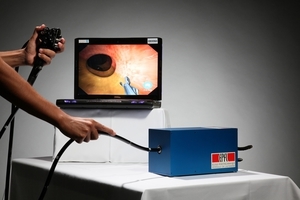 With this in mind, CSIRO has developed a colonoscopy simulator that enables trainee surgeons to interact with accurate, computer-based simulations of the human colon using a modified, clinical colonoscope and realistic haptic (force) feedback. The simulator provides photo-realistic rendering using gaming technology (OpenGL) and high-fidelity physics simulations using the processing power of the latest NVIDIA graphics cards. Such data integration will help researchers better explore and interpret genetic information to find markers for diseases, such as colorectal cancer, and thus reduce their impact.